UCF knew it would have its hands full on Thursday night against an under-the-radar Temple team. The Owls, winners of five of their last six games, were tied with the Knights for the lead in the AAC East going into the match. UCF managed to take hold of its division, beating Temple 52-40 in what was largely a shootout. Quarterback Anthony Russo passed for 277 yards and three touchdowns in the first half alone. He also ran for 40 yards on top of that. UCF’s offense, however, was able to respond enough to keep the Knights in the game. 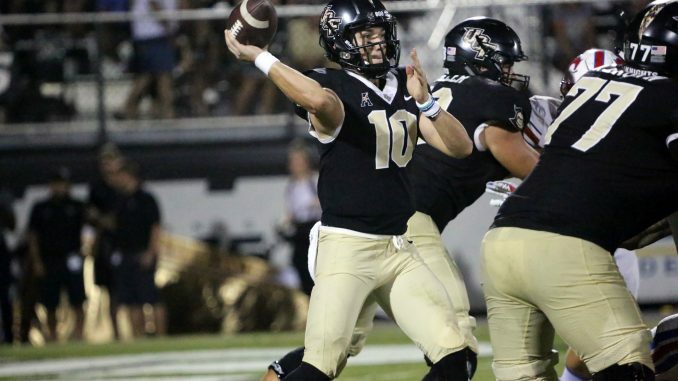 McKenzie Milton, who had missed last week’s game with an injury, showed no signs of rust and passed for 233 yards and two touchdowns in the first half. Despite a shaky defensive performance, UCF went into halftime only down 34-28. Coming out of halftime, the defense immediately showed improvement. Despite allowing several big plays, the Knights managed to hold the Owls scoreless in the third quarter, giving the offense time to build up a bit of a lead. Thanks to a spectacular throw under pressure by Milton, UCF took an 8-point lead into the fourth quarter. The Knights managed to stay just ahead of the Owls in the fourth, holding on to win 52-40. Temple scored just six points in the second half.